We take a tent, two backpacks, some food and fishing rods. The only necessary things to hole up for a week in Norwegian woods. The plan is to walk from one lake to another. This Scandinavian country is often associated with large amounts of fish, beautiful landscapes, short summer nights, fjords and clean, brisk air. These essential elements of a true trip into the nature sound encouraging. We optimize to see as much as possible while spending as little as possible. In fact, it is to a large extent feasible. We land at the airport located about 45 km north of Oslo. There is no customs clearance. Shortly after leaving the airport we ask ourselves the question: “What are we supposed to do now?”. So we return to the airport and buy a map. The second needed thing is a cartridge for a portable stove (equipment that can not have been taken on board). Unfortunately some local gas stations do not sell the same type we are looking for, so we go to Jassheim, a nearby town. We come to a well-equipped shopping center. It is weird to be in the fishing store the size of a big supermarket. I wouldn’t exaggerate if I say that are over a hundred different rod models on offer. Norwegians are really crazy about equipment. We’re almost ready to enter the deep forest for good. 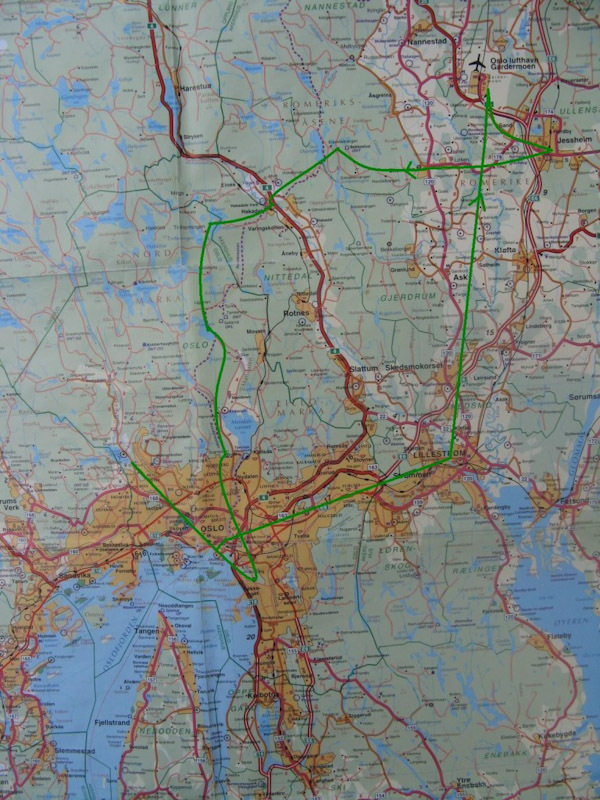 We set an initial route to Oslo on the map. Before that happen we get to know a local entrepreneur who gives us some useful tips. All Norwegians we meet are very sociable and talkative. However, we came here for another reason, which is to hide for a week from the civilization. We are already on the good way to little-populated areas. The map is almost blue because of that many lakes over there. The first place for the night turns out to be quite unfortunate. We go over some fence next to a field. We start to pitch the tent nearby trees. After a while an unexpected company appears. It is a herd of cows and bulls. Animals are very curious about the two newcomers and what they are doing in their territory. My friend Pisi is terrorized by animals so he runs up a tree. Animals all the time try to catch him, keeping a close watch over the trees. During this time I manage to escape and jump over the fence. I wonder what to do next, because we have recover the luggage, somehow. I walk back into the forbidden territory and tease animals so that all of them run right after me. In due course I leap over the fence on the other side of the field. I am able to distract their attention for about a minute and this the time Pisi uses to come down the tree and throw our luggage into the safe place over the fence. This means that we definitely need to find another place to stay. Finally we pitch our tent deeply in the dense woods. An uneven surface is worth sleeping peacefully. The next morning we find the correct path. A very diverse one. Here we can see a lot of sheep grazing at large. Shepherds let them go for a few months to graze. Later on thanks to the little bells it is easy to find sheep. 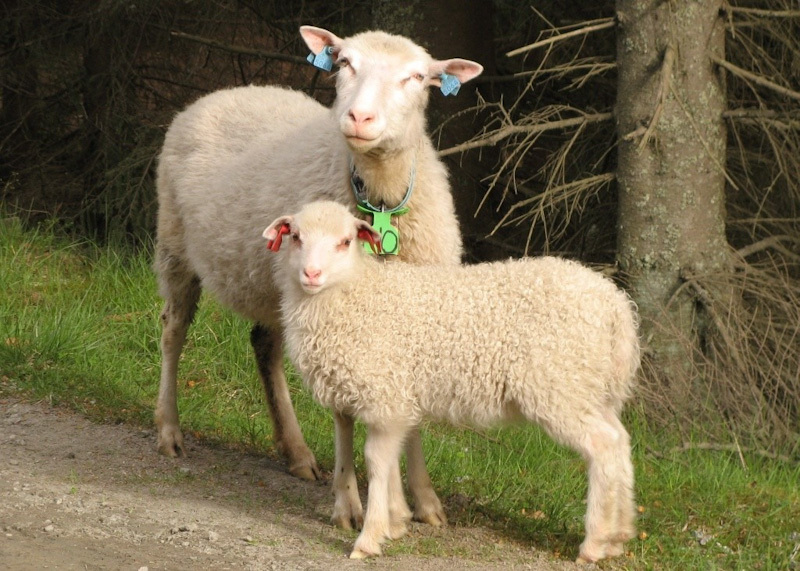 On the average one in ten sheep is lost. Still it is a beneficial form of self-breeding. A bit later we find some rocks, just enough to practice climbing. We drink crystal clear water straight from a stream. It tastes great, especially served in a perfect cold temperature. Further the situation is somewhat complicated. We come into a very wet, swampy trail. Water is splashing under feet every single step. Sometimes we need to stray from the route to look around for less swampy areas. Evading the marshes becomes a notorious task. Instead of going just straight we add many miles. At the end we come to a extremely boggy quagmire. In addition it happens to be a blind alley. 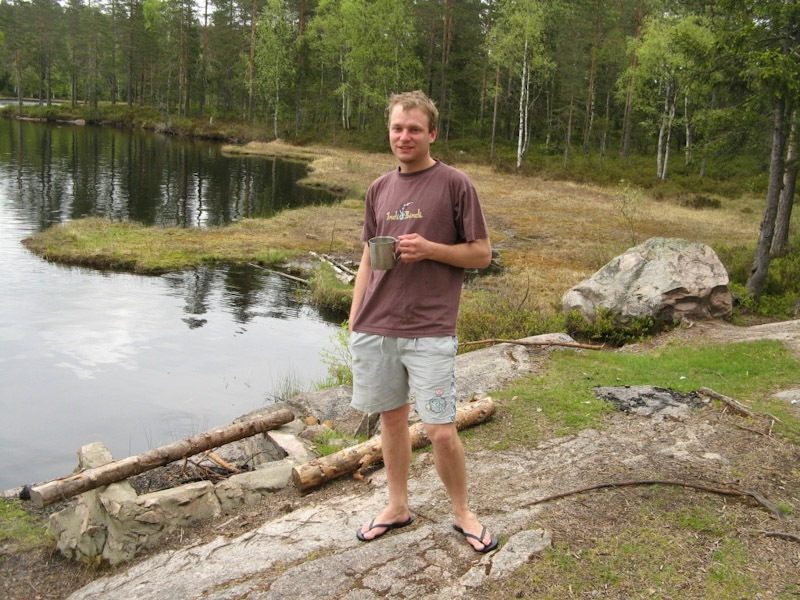 We take off our shoes and traverse for a hundred meters barefoot with water bubbling all the time. My legs go sometimes as deep as up to the knees into the swamp. Storoyungen the picturesque lake that becomes the proper culmination of our efforts for the day. We run a small feast. I prepare Chinese noodle soup, tinned food sandwiches and two cups of hot tea. 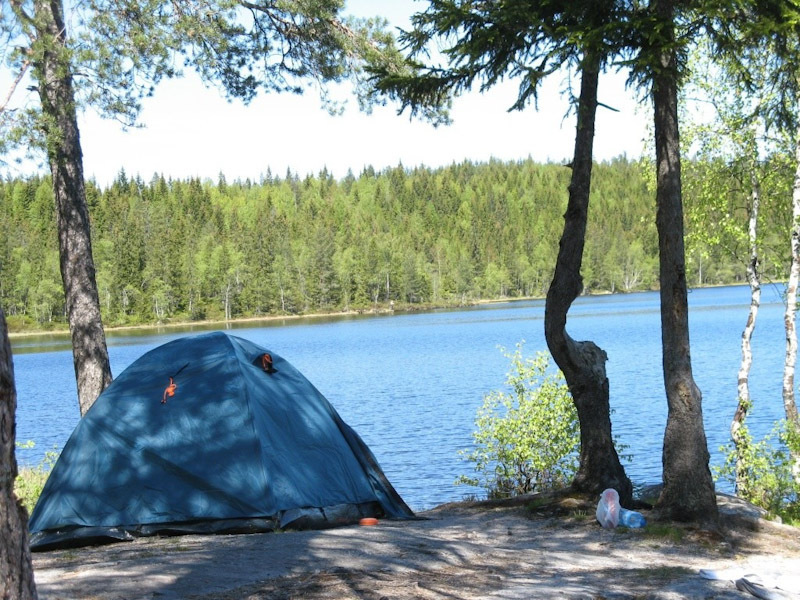 We pitch the tent on a big smooth rock in a way that we can enjoy the view of the lake from the inside. This is a particular, long evening. We open a bottle of Żubrówka to celebrate finding this place. Night is very short, so we are not able to drink all the bottle until dawn. In May it is getting bright at about three in the morning. At that time, before going to bed, we try to catch fish for breakfast. Night fishing comes out to be unsuccessful, with no fish caught. Not even once, despite many attempts, in different lakes, with different bait we couldn’t catch any fish. I pass the blame on the cheapest available fishing rods purchased on the Internet. The next day something strange happens to me. My leg starts to hurt so much that I am not able to stand on it. I suspect it has something to do with the alleged bite when crossing the swamp barefoot. There is no question of hitting the road again. Fortunately, we are in a beautiful, secluded place on the lake. Waiting here an extra day sounds like a good idea. Luckily the following day the pain relieves. We move on, trying out different trails, sometimes cutting short and in case of a doubt we use compass for directions. Shortcuts often mean the need to cross wetlands. Of course there is a lot of wetlands on the trails as well. To facilitate the passage of a very slippery marshes in some places there have been placed special logs and some places even have a footbridge. Our route crosses to move from one to another lake. We do breaks for meal and when the night is approaching we are looking for place to pitch a tent. It’s good to find a place to sleep before it’s dark, as once we pitched a tent in a place nearby plenty of ant hills. On the route we very rarely meet any people. Usually two, perhaps four people a day. Each lake we camp on is different. So we visit lakes situated in the valley, on the plateau, shallow or deep ones, with waves or a smooth surface, a different type of bottom and surrounding landscape. 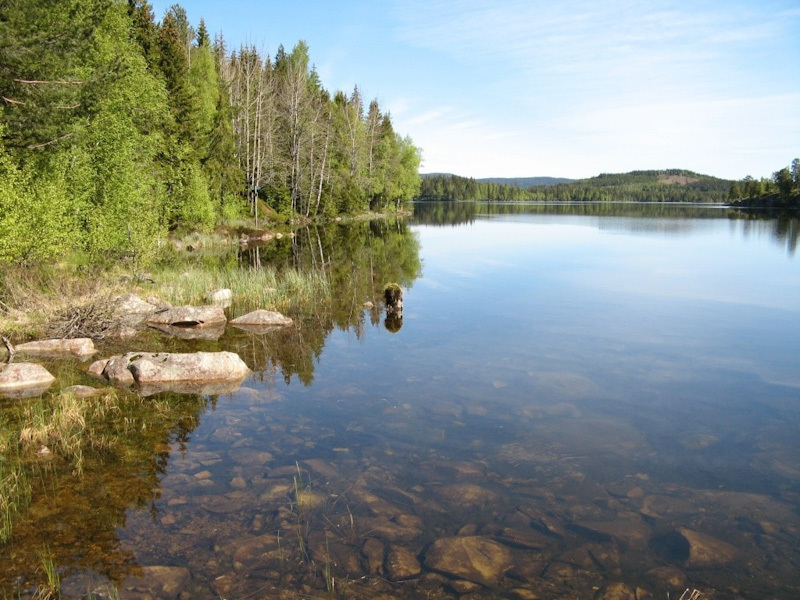 Most arguably a pure water with an excellent bottom visibility is common for every lake. We are approaching the outskirts of Oslo. The weather deteriorates today and for the first time it begins rain. On the way we join another three hikers, how go really fast with their small backpacks. They know how to lead us through the forest. The final miles in the rain come by very quickly. I don’t care anymore if I walk through into a marsh or a deep puddle to get even more soaked. After half an hour I’m completely soaked. We are really luck to find an abandoned building in the woods. We say goodbye to new friends and pitch a tent on the roofed veranda of the building. Tomorrow the last part of the Oslo route. It rains all the time from early morning, like a day earlier in the evening. 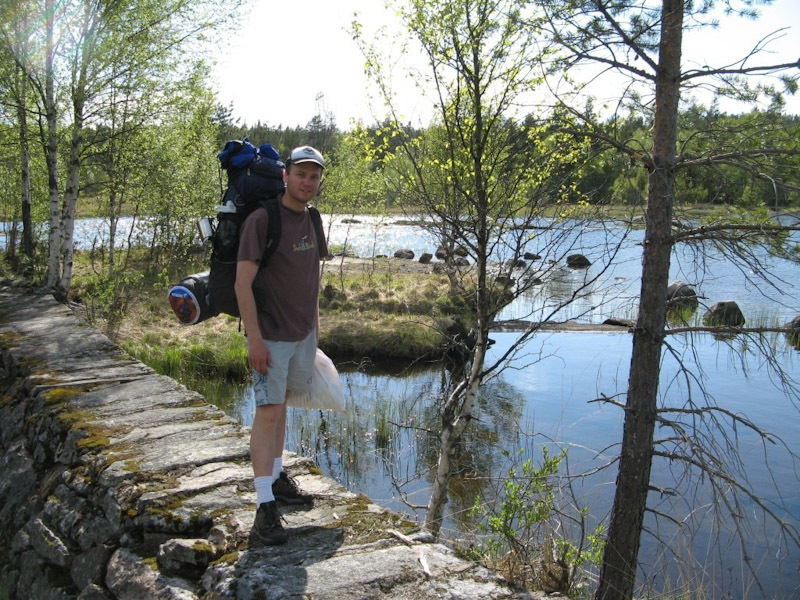 We go anyway, because the north metro station in Oslo is just one hour away. It’s quite amazing, but in spite of hopeless and rainy weather, I see lots of people practicing outdoor activities. Biking, jogging, Nordic walking. There are even two lively old ladies wearing rain cloaks. The popular Finnish saying “there is no bad weather, only bad clothing” also applies in Norway. Once we come to Sognsvann subway station in Oslo we are soaked through. After five days in the forest we look quite strange with a big city in the background. Some people give us guidance on how to find a campsite. Finally we pitch our tent. We take the first hot shower in Norway and we’re ready to go sightseeing Oslo. City center at first glance looks similar to Riga. Shops, bars, fountains, plenty of open spaces, historic buildings and interesting architecture. We head towards port to visit the Akershus fortress. While traversing the fortifications, we see a big passenger ship MSC Lirica departing Oslo. There are many sculptures and little monuments in random places in the city. All the urban decoration have been skillfully blended into the remaining architecture so that sometimes they become almost imperceptible. The city is extraordinarily expensive. For this reason, we minimize spending. On the other hand, being in the capital should mean having a beer, at least. We find a nice pub on one of the main streets. The sculptures I mentioned are actually not for no reason. 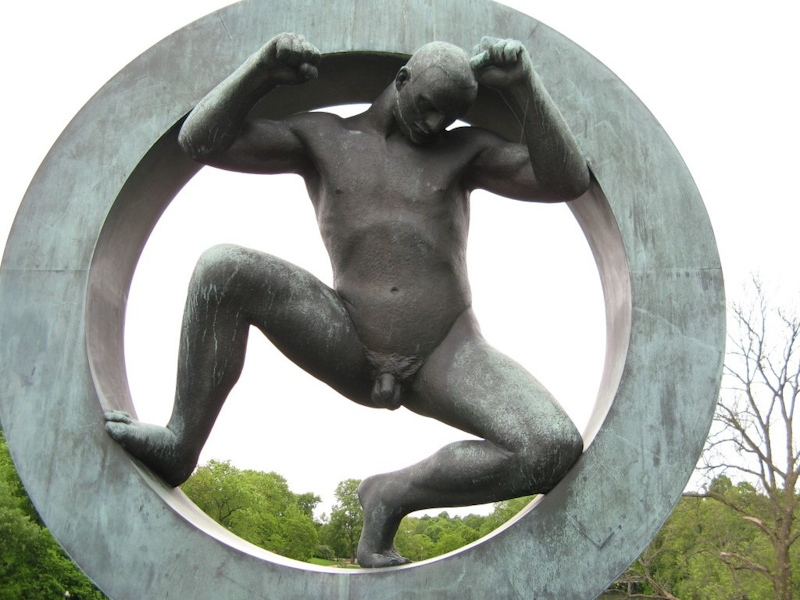 The pride of the city is Vigeland Park, due to the designer and contractor also called Frogner Park. Frogner, a famous sculptor, lived in Oslo and in return for sculpturing the city supported him throughout most of his life. Park consists of 212 sculptures in stone and bronze, representing a total of nearly 600 characters. The idea is to illustrate people in different positions, ages and social status. Later we visit the Holmenkollen ski jump. Unfortunately, there is no entrance to step on the ski jumper’s runway, however a look through a window in enough to imagine what a jumper feels right before the start. The jump situated on a hill is one of the highest points in Oslo. On the way back we go up to the museum of skiing. My special interest rises to the history of snowboarding section. The first snowboard has been made in 1981. It was a primitive construction made of a wooden board with cycling tubes as bindings and some screws on the padding so that the shoe sole is firm and not slippery. We leave tomorrow morning. Instead of pitching the tent we decide to spend the night at the airport terminal. Waiting for the morning lasts short, because we get to know a very nice American girl named Bess, who has a similar time flight back home to Minnesota. 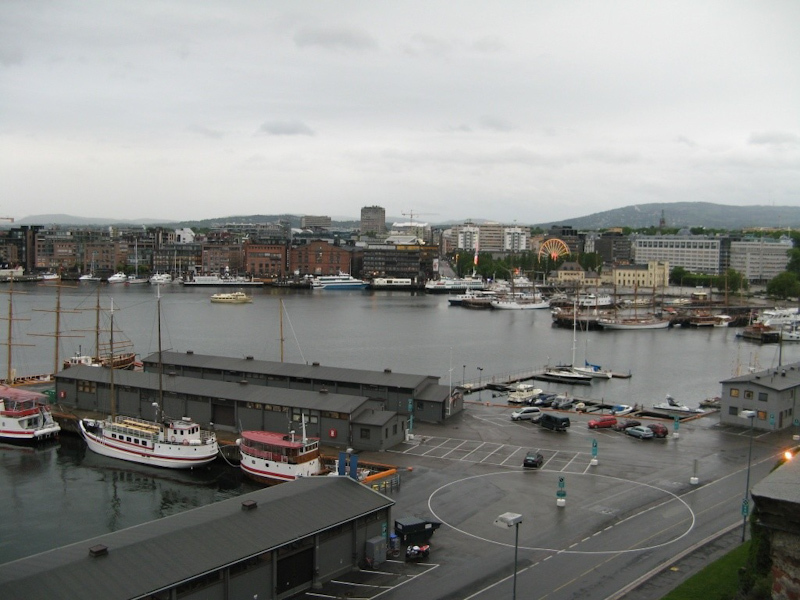 Many of her friends wanted to go to Spain and Italy in Europe, so she decided to travel through Scandinavia on her own. Norway is definitely worth it. I also invite you to see the photo gallery.